I try to be as zero waste as possible; however, I still have a lot to learn about plastics and their effect on the health of humans and the environment. I began my summer internship feeling confident in my knowledge of how I was doing my part for the environment only to discover that there was so much I had yet to learn. Beach Environmental Awareness Campaign Hawaii (B.E.A.C.H.) 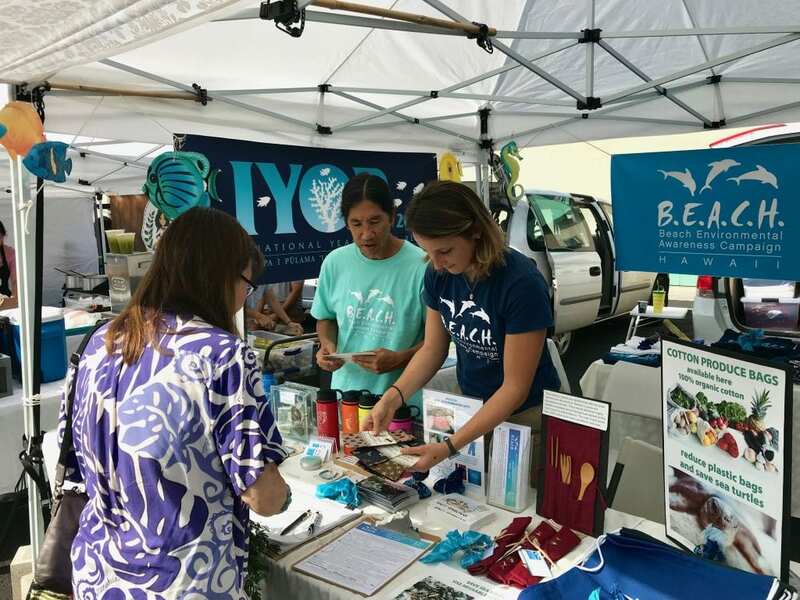 is an all-volunteer non-profit, located in Hawai’i, that brings awareness and solutions to plastic marine debris through environmental education, marine debris removal and research, and plastic reduction and litter prevention. The amount of marine debris has risen exponentially since industrialization, yet it was not always as dangerous as it is today. It began with glass and metals washing ashore on beaches, but as plastics were invented and became more widely used, the marine environment has begun to suffer. Plastics are detrimental to our health and the environment but little has been done to educate the public about the numerous autoimmune diseases and cancer that plastic can cause. Not only that, but marine organisms have also suffered from being entangled in, ingesting, and having their habitat destroyed by plastic. For example, in the life cycle of a sea turtle, jellyfish are a large part of their diet. Sea turtles then consume plastic bags because of their resemblance to jellyfish. There is a myth that turtles choke on plastic bags and die; however, the reality is that when they swallow a plastic bag, their body makes them unable to digest the bags. If they eat too many they become positively buoyant and can no longer dive down for food, so the reality is not a quick death from choking, but a slow 60 day death from starvation and dehydration. Coral reefs have been ripped apart by microfilament nets, Albatross sea bird chicks have died from stomachs full of plastic, and phytoplankton have even been found with traces of plastic in them. By plastic making its way up the food chain, it has been predicted that if humans continue to consume and dispose of plastic in the way we do, in the next 20-30 years there will be more plastic than fish in the ocean. B.E.A.C.H. has been around for the past 12 years educating the public about plastics and the threats they cause to the environment and our health. I attended two outreach events every weekend and got a chance to educate the locals and tourists on the island. B.E.A.C.H. 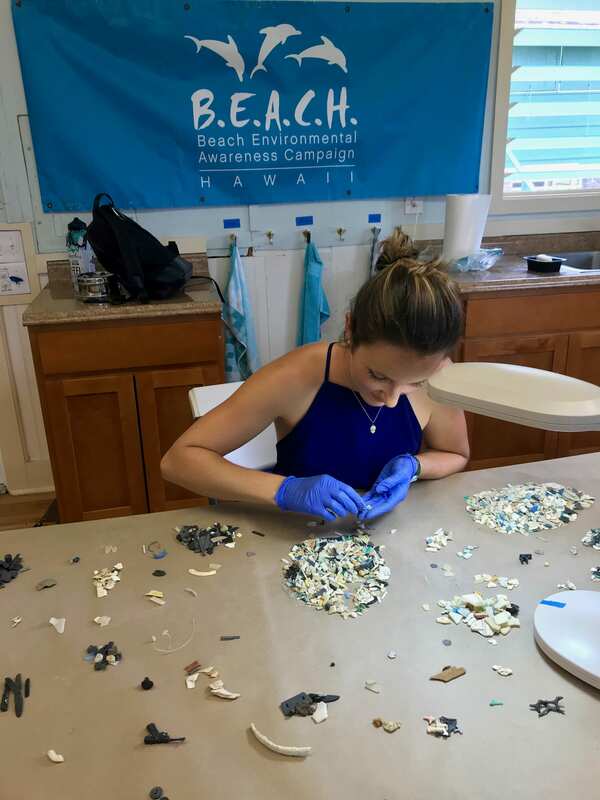 has trained many volunteers and interns on how to collect marine debris of all sizes off the beaches, then sort them and identify their countries of origin. Hawai’i is located in the North Pacific Sub-Tropical Gyre, a giant current that pushes water around in a clock-wise circle from the east coast of Asia to the west coast of North America so most of the marine debris that washes up on the Hawai’ian shores are from Asian or North American countries surrounding the gyre. The Hawai’ian islands trap marine debris as it floats endlessly around the gyre, getting broken up into small pieces. Since plastic essentially never biodegrades or decomposes, the biggest threat to the oceans are the micro-plastics that are 5 millimeters or less in size, which is why it is important to remove micro and macro-plastics off the beaches. As a B.E.A.C.H. intern, I sifted sand with plastics into sizes, then sorted them into categories of natural and unnatural debris. The unnatural marine debris was then sorted into separate categories of plastics we could identify. This data was counted, recorded, and inputted into excel. B.E.A.C.H. has been focusing on research and outreach, which are the activities I helped out with. They aim to release their data in a way that it will be widely accessible to the public so that people can educate themselves on the problem of marine debris. With this research they hope to confront companies and countries about their plastic waste in order to push for regulations that will reduce plastic production. In turn, improving the health of our marine environment and us.